Welcome to a new year at Fun Van. We wanted to take some time to introduce you to our Fun Van Educators. We will introduce a new educator for the next few weeks so that you can get to know our awesome team! I used to love playing with my Speak and Spell! What did you do before working at the Fun Van? I taught 4th grade, 1st grade and preschool before moving to Arizona and dedicating my days to raising my daughter. How Did you hear about the Fun Van? My sister-in-law found the position posting on Indeed.com and said, “You should do this!” It was perfect because my husband was transitioning out of the Marines and becoming a real estate agent. I was a stay-at-home mom and wanted to support my husband while he found his footing in his new career. What do you enjoy most about working at Fun Van? I love when parents return to class and say they tried something we discussed in regard to their parenting and it worked. I also love watching the children learn new social emotional skills. Often times this is the first time they have the opportunity to practice these skills with other children within their age-range. I like to travel and explore new playgrounds with my children. Research different tools for parenting young children because what works today won’t work tomorrow. 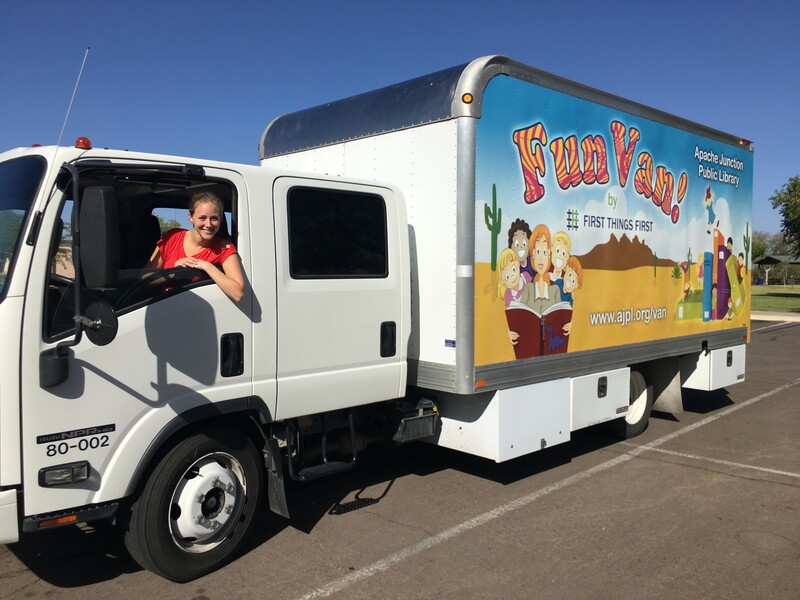 Fun Van is a great resource for parents to share ideas and discuss parenting challenges. What’s one of your funniest parenting moments? My daughter was potty-training and was at the top of a slide. Unfortunately, it turned into a “water” slide! What’s one of your favorite books and activities for your Fun Van families? Cut a big paper bag with arm holes and neck holes to look like a vest. The children decorate it with collage materials to create their own paper bag outfits. Come to Fun Van so we can share and laugh at our funny children and crazy parenting stories! What an awesome idea and a wonderful experience for both parents and children! Wish they had something like that when my children were growing up!